In today’s twenty-first century business world, there is so much cut-throat competition between companies and it is for this very reason that companies have to make sure they only hire the best of the best onboard. Once you have submitted your resume to the company, then the next stage is the interview stage which will be key in deciding whether you will get the job or not. So as a recruiter in the company, in the event of giving constructive feedback after the interview you can follow these simple steps to ensure that you are saying something of worth which interviewees can take back with them. Providing feedback after interview is very helpful for employees in advancing themselves. The importance of feedback plays a vital role in employees growth. The following mentioned are few tips on giving constructive feedback. When you are giving constructive feedback after an interview it is important to ensure that you are not acting like a condescending ‘know it all ‘merely because you are sitting on the other side of the desk. You should remember that at one point in time you too were a young professional looking for a job and eager to learn new things, this having been said you should ensure that you speak in the gentle manner in which a teacher speaks to a student. If you act in a condescending manner then you will end up hurting the individual’s ego. Now that the interview is complete you can tell the person to take it easy simply because his time for speaking is over and now you can give your constructive interview feedback to him. 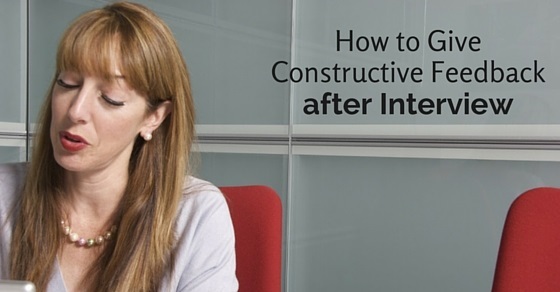 Just because you are an interviewer or senior in a company, do not forget courtesy. The mark of a true leader is humility so ensure that no matter what you achieve or how successful you become you should never think that it is alright to treat people as though they are inferior or subordinate to you in anyway. So try to make him or her feel at ease to the best of your ability. In the event of giving constructive criticism in order to get your point across in a more comprehensive manner you should furnish some constructive criticism examples which will really drive home the point well. So for example, if you are trying to tell the individual that he or she should speak louder or modulate his voice more, then rather than just saying this out point blank you should go right ahead and say the same sentence in two different ways, first in a dull tone and second in a bold and clear voice. This will really make a big difference and your personal involvement will be much appreciated. While trying to help the individual get better, ensure that you are not hurting the person’s feelings or coming across to overbearing and strong. Too many negative comments could really shatter a person’s confidence and instead of building him or her you will end up doing the exact opposite and breaking him down. So this having been said, you should remember that you are meeting the individual for the first time , he or she doesn’t know what you are like as a person, so ensure that you do not say any and everything which pops into your mind. Giving positive reinforcement is something which can go a long way in boosting person’s morale. Think of it this way, that if you were someone trying to find some kind of footing in the business world and a big recruiter in a company, pays you a compliment, wouldn’t you feel extremely good and wouldn’t you feel like this is some kind of validation for all the hard work which you have been putting in for such a long time? It will not hurt you to be nice, so ensure that you are not merely polite but also an epitome of geniality, grace as well as charisma. In the event of trying to assert your authority make sure that you are not making the other person feel small as well as inadequate in any way. At the end of the day you must remember that none of us are perfect and it is only with time that we keep getting better and better. Know that you too started out confused and at sea about what to do, so do not act as though you came into the business world knowing it all. Helping someone is certainly a noble thing to do and you can rest assured that he or she will be eternally grateful that someone as successful as you gave invaluable advice. The very fact that the person has decided to become a part of the business world, implies that from the beginning he should be prepared for anything that comes his way whether good or bad. Though he or she might be young or even inexperienced it certainly does not imply that you should treat this person as a child. So rather than desperately looking for a way to sugar coat something, be honest and just go ahead and say it. Right at that point, that person may not appreciate your honesty but in time to come he will understand the truth in your words. As we are all well aware that in this day and age time and money are both invaluable resources which should not be wasted at all, so this having been said you should ensure that you too not waste even the smallest amount of time in beating around the bush. Rather the manner in which you are speaking should get the point across that you are someone who values time and knows the importance of even a second. So if something can be said in ten words ensure that you do not speak a thousand words in the event of trying to show what a skilled orator you are. In the event of not being happy with the interview, you should just go ahead and say that you do not think the person has what it takes to bag the job. Ensure that you are not giving your definite answer right then and there but at the same time you must make sure that you are not praising the person unnecessarily and giving him or her false hopes about getting the job even if you are well aware that he or she is not someone who you think would be an asset to the company. After all there is some truth in the common saying that honesty is the best policy. Just so that you do not find yourself at sea about what feedback to give at the end of the interview you can always jot down a few pointers in the course of the interview which you would like to discuss later on. Being a recruiter or an interviewer, naturally you will be having a lot of things on your mind, so doing this will really help you along the way and at the same time it will silently communicate to the interviewee that you are someone who takes a personal interest in whatever you are doing and this quality is indeed admirable and a mark of a true inspiration. When you are giving constructive feedback after an interview, ensure that you are not giving ambiguous comments which do not add up to anything at all. So no matter what, ensure that you are not going off point at any point in time and that you know exactly what you are talking about. If you think that something needs to be said then you should go ahead and just say it, yet on the other end of the spectrum if you think that you should let one or two things slide then that is alright too. So ensure that you are particular about what you are saying and have your wits about you. When giving constructive suggestions or feedback ensure that you give some concrete pointers which are applicable to that person alone rather than just saying some conventional, clichéd things which will not really benefit the person in anyway. Unless you speak well and in a clear, concise as well as comprehensive manner you will not be able to get the respect which is actually due to you. Even if your advice comprises of two sentences, ensure that those two sentences will really make a difference to that person. One of the best ways to put the person at ease, before you actually go about giving constructive feedback, is by narrating a few anecdotes, from your own experience. Such anecdotes are always fun to hear, so you can use these as ice breakers which will really allow the other person to open up and at such a time you can see the individual for who he really is. When you are giving constructive feedback ensure that you are not acting as though you are doing the other person a favor by giving them some pearls of wisdom. So unless. you really are in a tearing hurry then try and take out some time from your busy schedule to actually help the person. While giving constructive feedback to the individual ensure that you are touching on those points which people do not conventionally mention, but things which actually make a huge difference. State that the body language of a person too can tell you a lot about how he or she is as a worker. So in short, tell him everything which you are looking for in the person you are going to hire. Giving constructive feedback does not mean that you embark on a monologue and even start praising yourself rather on the other hand; you should ensure that the focus of your attention is the person who you have just interviewed. Last but certainly not the least is that you should be positive and encouraging rather than being both negative as well as demeaning. If for a fact you can tell that this person is going to make it big in the corporate world then you should go right ahead and tell him this and you can rest assured that these words coming from you will mean the world to him and will most certainly make his day. So these are some of the chief pointers which you have to keep in mind that would help you in giving constructive feedback on interview. As time goes by and you gather more and more experience then automatically you will be able to give better advice and more constructive feedback. Rather than trying to be closed you should do your best to help people improve themselves so that in their next interview they can perform even better and be able to bag the job. Feedback does not have to be criticism, it can also be positive feedback which you can give. Previous articleHow to Ask your Boss to Work from Home? Next articleWhat to do when a Coworker takes Credit for your Work?